You’ve probably heard that LED is better, but why? Learn more about LED lights and the top 5 reasons you should switch to LED lighting. A LED is a light-emitting diode, a semiconductor device that emits light when an electric current passes through it, converting electricity into light. When one or more LEDs are combined with an electrical driver and placed in a housing, you have a complete LED light bulb or LED light fixture. In technical terms, you may hear these referred to as LED lamps (instead of light bulbs) or luminaires (instead of light fixtures), respectively. LED lighting is considered solid-state lighting (SSL). The term solid state refers to light that uses semiconductor light-emitting diodes (LEDs), organic light-emitting diodes (OLED), or polymer light-emitting diodes (PLED) as sources of illumination rather than filaments or gasses. LED lights boast an energy performance that other light bulbs fall short of. LED can reduce 70-90% of costs over fluorescent and incandescent lighting. How? LED lights are directional lights, which means they emit light in specific directions where fluorescent and incandescent bulbs emit light, and heat, in all directions. The directional lighting is just one of many reasons why LED is Cocoweb’s choice for picture and piano lights. LED lights use less power (watts) per unit of light (lumen) generated. Therefore, they are not only much longer-lasting in lifespan but also lower your electricity bill. 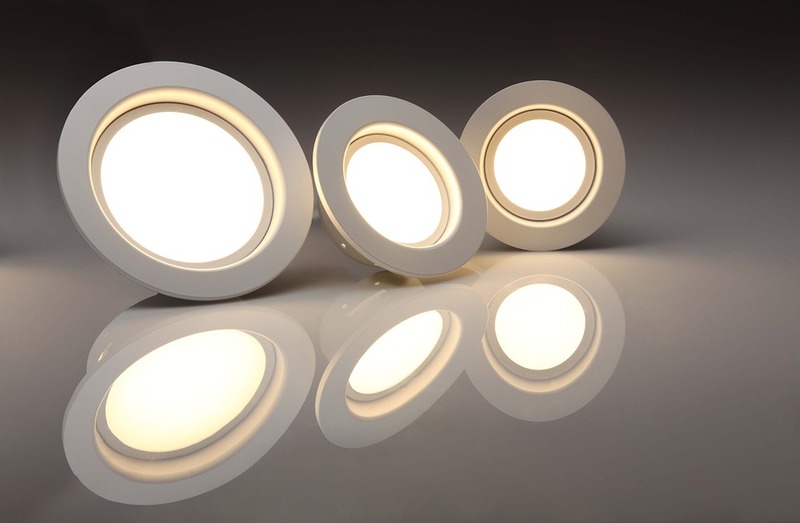 While LED’s provide 100 or even up to 200 lumens per watt; CFLs, in contrast, use about twice the amount of watts and incandescent light bulbs around 10x as much power with only 18-20 lumen per watts. A LED light bulb is therefore almost 50 times more efficient in lifespan, about 20 years, and 70-80% more energy-efficient than a conventional incandescent option. Impressed yet? With incandescent bulbs, 90% of their energy is released as heat; about 85 BTU/hour. On the other end of the heat index, LEDs give off a scant 3.4 BTU/hour! This low heat index is what makes LED lighting perfect for art lights, with little to no heat radiating near the art to damage it. Because LED lighting systems don’t radiate heat the way an incandescent or halogen light bulb does, the heat produced from the power going into the product must be drawn away from the LEDs. This is usually done with a heat sink, which is a passive device that absorbs the heat produced and dissipates it into the surrounding environment. This keeps LEDs from overheating and burning out. Thermal management is probably the single most important factor in the successful performance of a LED product over its lifetime because the higher the temperature at which the LEDs are operated, the more quickly the light will degrade, and the shorter the useful life will be. LED lights are also much safer for your home, as they are mercury free. If you some reason a LED bulb were to break, you would not need to worry about your children, pets or even yourself coming into contact with the harmful substance. However, you’re likely not going to have to worry about a LED bulb breaking, as they are made mostly of metal and plastic, rather than glass and a fragile filament. LED lights give a broad range of lighting options. These versatile arrays can be produced to give off a variety of white lights. The most traditional light color is 2000-2700 kelvin, a warm white, which matches the light typically emitted by incandescent bulbs. Cocoweb’s lights shine at 2700 kelvin. 3500 - 4100 kelvin is a cooler and brighter white, which works well for kitchen and workspaces. A bluer 5000-65000 kelvin light is ideal for detail tasks and reading. Why does LED cost more? Turning a LED into a light bulb requires the integration of some pretty sophisticated technologies. Both the manufacturing process and the materials used are more expensive than traditional light bulbs. Although LED light bulbs and fixtures initially cost more to purchase, the added expense is recovered in energy savings and by avoiding replacement costs. Now that you know the benefits, you can make a wise choice and choose LED for your lighting needs!